Discover a natural site with arrangements that are perfectly integrated to an environment of exceptional beauty. The Parc du Bourg de Pabos offers a restaurant, walking paths, cycle track, recreational park, beaches and picnic areas. 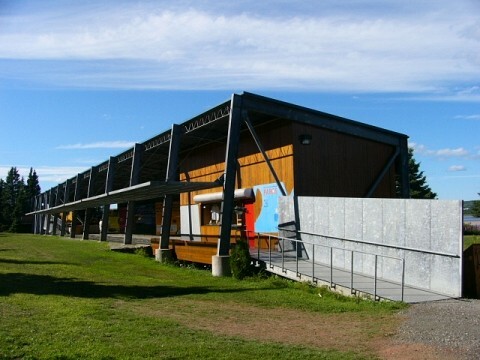 The interpretation center of the historical and archaelogical site of Pabos: The Seigneurial of Pabos was the main fishing station of Gaspésie in New France. The archaelogical excavations updated the vestiges of this past history explained at the interpretation center whose permanent exposition was renewed in 2011. The visitor has access to a site which reconciles outside spaces (archaelogical paths, historic promenade, restored cabana from the XVIIIe century) and interior exposition areas showing the archaelogy of Pabos. Ura (NEW): Eight stations multimedia tour on a seaside site that offering an immersive experience, in the day and in the evening, revisit the local history based on the WATER. Nova Lumina: Under the starry sky of Chandler, at the mouth of the rivers of the Grand Pabos, you are invited to discover a nocturnal journey inspired by the meeting between the earth and the sky. True complement to the incomparable tourist offer of the Gaspésie, this path by the sea is an immersive experience and fantastic adventure. La Grave Restaurant: The restaurant offers a magnificant view of Baie du Grand Pabos and Beau Séjour island. Gaspsesian products (fish and seafoods) occupy top choice on the menu. The camping Bourg de Pabos: Rated 4 stars by Camping Québec, the facilities of the Parc du Bourg de Pabos campground are sure to appeal to the whole family with their exemplary cleanliness. The hiking and biking trail: Twenty kilometers of trails allows the observation of the wildlife of the Baie du Grand Pabos. Belvedere and rest areas are found on the trails. The beaches: More than one kilometer of beaches facing the Chaleurs Bay are freely accessible to all visitors. Toilet nearby. Lifeguards on site. Recreational park: Young families have free access to a recreational park with aquatic and games. Circuit des Bâtisseurs: The biking and hiking trail of the Circuit des Bâtisseurs is accessible from the office of the historical and archaeological site. It provides access to the municipality of Chandler using the bridge overlooking the entrance to the Bay of Grand Pabos. Schedules vary from one activity to another, please visit our website for more information.